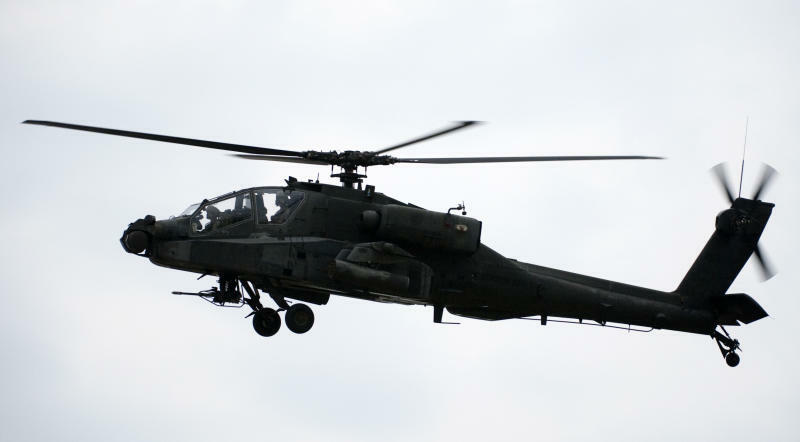 Washington (AFP) - The nearly 500 American troops sent to Baghdad to bolster security for the US embassy are equipped with Apache attack helicopters and small unarmed surveillance drones, Pentagon officials said Tuesday. President Barack Obama on Monday ordered 200 additional troops to the Iraqi capital to ensure the safety of American diplomats and other personnel working in the city, as Baghdad government forces face a challenge from advancing Sunni extremists. The reinforcements will include troops to fly and maintain Apache attack helicopters and unarmed surveillance drones, Pentagon press secretary Rear Admiral John Kirby told a news conference. The drones were not Reapers or Predators but smaller Shadow robotic aircraft that are launched from a catapult, a senior defense official, who spoke on condition of anonymity, told AFP. The Shadow aircraft, which have been heavily used by US forces previously in Iraq and in Afghanistan, are about 14 feet (4 meters) long and can fly at an altitude of 8,000 feet (2,400 meters). The US security contingent will concentrate on safeguarding access to the Baghdad airport as well as the embassy, the official said. Kirby told reporters that the additional troops would "help provide extra security for our facilities, our people, our property, and to also allow -- to help allow the State Department and the embassy to continue to function as it is." The embassy remains "open," he added. The deployment brought the number of US troops in Iraq devoted to security to about 475. In addition, Obama has approved sending up to 300 military advisers, and 180 of the advisers are already on the ground studying the state of the Iraqi army, Kirby said. He would not say whether the US move was based on an assessment that Baghdad was under a heightened threat. The situation "continues to be very dangerous" and "the threat continues to be very real," Kirby said. "But we have seen Iraqi security forces in and around Baghdad begin to reinforce themselves and prepare to defend, and they are taking the offensive," he said. "And we saw this over the weekend up near Tikrit," said Kirby, referring to a counter-offensive by Baghdad government forces.